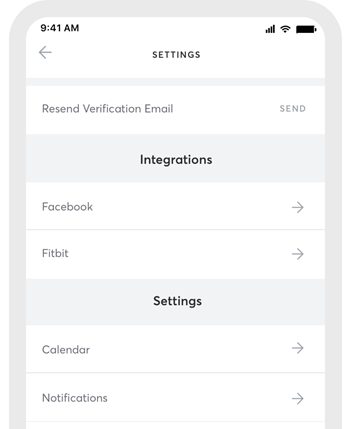 With automatic syncing, each class reserved through the MINDBODY app is added to your default phone's iCal or Google calendar app. Start on the Profile screen. Tap on the button beside "Send schedule to my Calendar." One you've enabled this setting, you'll see Notification options. Here, you can choose which calendar you'd like your bookings to show. Never miss another workout! Note: You may need to enable your calendar's permissions from your phone settings under Settings>Privacy>Calendar. Note: In order to see the button to add a reservation to your calendar manually, automatic syncing must be disabled under Profile>Settings>Calendar>Send Schedule to my Calendar. If you prefer not to add your entire class schedule to your calendar, you can still sync individual classes. You can do this right after booking a class--just tap on Add to Calendar! You can also go to your scheduled classes, find the class you're wanting to send to your calendar, and tap Add to Calendar from the Class Detail screen. When you cancel a class through the MINDBODY app, the class is removed from your phone's calendar. If your class is canceled by the business directly, then you will need to manually remove the scheduled class from your calendar. Note: If your reservation is cancelled by the business on their end that change is not reflected on your synced calendar and you will need to manually remove the cancelled reservation from your calendar.